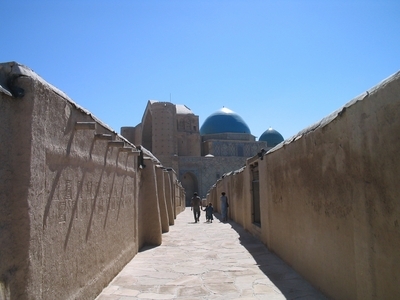 Shrine of Hojja Ahmet Yesevi, 14th c. CE, Turkestan City, Kazakhstan -- Photograph 2005 By Stephen Schwartz. December 2011 marked two momentous anniversaries. The suicide by burning of Mohamed Bouazizi, a Tunisian street vendor, occurred on December 17, 2010, one year ago. The dissolution of the former Union of Soviet Socialist Republics took place on December 26, 1991, two decades past. Bouazizi's act began the series of political upheavals known as the "Arab Spring" – leading to the fall of Tunisian dictator Zine Al Abedine Ben Ali, then Egypt's Hosni Mubarak, and Libya's brutal buffoon, Mu'ammar Al-Qhadhdhafi. These convulsions were greeted by Western democratizers and Muslim moderates as the herald of a thorough transformation of political and social structures in the Islamic countries. But the first indication that the "Arab Spring" would not produce the flowers of summer came with the emergence of Syria, ruled by Bashar Al-Assad, as a bulwark of tyranny and repression. Since political conflict began in that martyred country, in March 2011, as many as 5,000 people have been killed. Egypt has joined Syria as a second pillar of violence and oppression in the Arab East. Although atrocities seen there cannot be compared in number, extent, or intensity with those in Syria, the Supreme Council of the Armed Forces (SCAF), which took power away from Mubarak, has engaged recently in running street fights with young Cairene demonstrators. Such was the background for the unrestrained beating on December 17 of Aada Kamal Abd Al-Halek, known as "the blue bra woman" after her Islamic headscarf and cloak were ripped open and her underwear and denim trousers exposed while soldiers and apparent irregulars attacked her with sticks. A video of the incident was uploaded to YouTube with understandable results: renewed outrage at the Egyptian military's retention of authority. At the same time, Egypt has undergone two phases in a three-part electoral process that has awarded a majority to Islamists. In the first round, held on November 28, the Freedom and Justice Party, a front for the Muslim Brotherhood (MB), gained 36.6 percent and in an alarming outcome, the Wahhabi (so-called "Salafi") Hizb ul-Nur or "Party of the Light" received 24.4 percent. The rise of a Wahhabi party in Egypt, with a full inventory of Saudi-style discriminatory attitudes toward women and non-Muslims, was a shock to all observers. In the second round, held on December 14-15, the MB had dropped slightly to 36.3 and Nur advanced to 28.8 percent. Liberal and moderate candidates, as well as members of the former state party, the National Democrats, have trailed the MB and Nur by large gaps. Syria and Egypt, the earliest territories wrested from Byzantine Christian control by the Arab armies of the first Islamic century, nearly 1400 years ago, have revealed, and even reinforced, the survival of despotic attitudes in their governance. In Damascus and Cairo alike, if for different reasons, the military keeps control by harsh punishments, and the people are reduced to "crowd outbursts." The most influential political alternative in Egypt, represented by the MB, may be reproduced in Syria, where the opposition has accepted the backing of the MB-linked Turkish "soft Islamists" of the Justice and Development Party (AKP) headed by Recep Tayyip Erdogan. It is necessary to look at the "Arab Spring" in a larger context. Some have compared the sequence of events with the disintegration of the Soviet empire; some have seen in the Arab developments a parallel with the frustrated "Green Movement" in Iran in 2009-10. Certainly, the past three-and-a-half decades have been dominated by insurrections and interventions aimed at democracy and independence for nations oppressed by dictators or denied ethnic freedom. In this paradigm, the separation and regroupment of the Soviet republics and satellites into successive blocs; the Yugoslav wars and liberation of Slovenia, Croatia, Macedonia, Kosovo, and Montenegro (with Bosnia-Hercegovina still divided today by Serbian occupation of nearly half its historic territory); the 2003 invasion of Iraq and overthrow of Saddam Husayn; the Iranian "Green Movement," and the "Arab Spring" offer differing hues in a single spectrum. One may extend the line of continuity back to the fall of the Berlin Wall and the Tiananmen Square upsurge in China in 1989, or even farther, to the collapse of authoritarianism in Portugal, Greece, and Spain and the Indian resistance to Indira Gandhi's emergency laws in the mid-70s. While Westerners panicked by the advance of Islamist politics in North Africa may wish to blame the faith of Muhammad for the incapacity of the Arab renovators to reach democracy, local history is much more relevant. The Islamic societies of the past were not essentially despotic; indeed, according to the late Israeli sociologist S. N. Eisenstadt, the Islamic empires were governed by a pluralistic balance between the sultans (usually military), the jurists, the pious foundations, and the spiritual Sufi orders. But an overlay of Islamic institutions could not change the despotic sociology of Egypt, with its long Pharaonic legacy, and Syria, with its heritage of Byzantine "Caesaropapism," in which the state, religion, and nationality were considered one. The "Arab Spring" and the "spirit of Midan at-Tahrir," the square in Cairo where the crucial demonstrations against the Mubarak regime and its military successors have been held, had positive effects elsewhere. Such were, at first, noted fleetingly by commentators and then ignored or mentioned light-heartedly. Here, too, one must apply a wider perspective. The "Arab Spring" came at the end of 2010, the year when the Iranian clerical stratum and the "Green Movement" reached a stalemate, with neither able to prevail. The years 2010-2011 saw rioting in Athens and London, as well as the spread of the "Occupy" movements in Europe, the U.S., and other countries. All of these phenomena are alike in some respects, but none merely imitates any of them. "Tahrir Square" is often cited as an inspiration by "Occupiers" and partisans of democracy, but neither Greek radicals nor British rioters face a theocratic dictatorship like that in Tehran, or a military caste such as violates women's modesty and sheds blood in Egypt and Syria. Nor do the demonstrators against the established system in the West call for new elections. There is one thing that most of the present-day trends so far mentioned have in common: the pretense of "leaderlessness," and lack of a program. "Occupy" activists, although they may be guided (as in Oakland, California, USA) by ideological leftists, disclaim any set of demands. In Egypt, Tunisia, Libya, and Yemen, the populace has leapt into a political void, knowing only that it desired an end to the autocrats ruling over it, and accepting the option of new supremacy by Islamists and, in the Yemeni case, potentially, by Al-Qaida in the Arabian Peninsula (AQAP). In contrast, if some ex-Communist states have failed to extricate themselves from "party-state" oppression, or seen "oligarchical collectivism" (as George Orwell described it in 1984) reordered as "oligarchical entrepreneurship," their elites cannot be said to lack a vision of the future, based on understanding of civil society, that is absent or negligible the Arab lands. Soviet Communism imposed universal literacy and claimed the cultural patrimony of the Enlightenment. Especially in the European ex-Communist zone, exemplified by the Baltic states, Poland, the Czech Republic, and Slovenia, dissidents and revolutionaries, even without "roadmaps" for construction of a new political state, understood what they desired in place of what they were forced to endure. Russia has a vibrant liberal tradition – often defeated, but never destroyed. China has maintained a humanistic criticism of its Confucian statism since the beginning of the 20th century; this mode of thought has been crushed but never eliminated completely. As 2011 has come to an end, new parallels with the events in Tahrir Square have been seen in China, Kazakhstan, and Russia. With no direct links to the Arab lands or the West, citizens of these geographical megastates have assembled to defy the corrupt and destructive policies of the usurpers under which they must live. China has provided a remarkable example of spontaneous rebellion in the village of Wukan, on the southern Guangdong coast, where residents defied party-state officials in four months of mass mobilization. Their grievance: private sale of communal lands to benefit individual bureaucrats. The revolt was aggravated by the death of a Wukan merchant, Xue Jinbo, 42, in police custody. Labor strikes have been reported in Guangdong, which has attained world renown as a center for foreign manufacturing enterprises. Events in Guangdong have been accentuated by an ongoing debate in which its Communist party chief, Wang Yang, has called for media openness and publication, for the first time, of a provincial budget. Work stoppages also have occurred in Shanghai and other industrial centers in China's eastern enterprise zones. In Russia, elections held December 4, and which gave a majority of parliamentary Duma seats to Vladimir Putin's United Russia party, have stimulated allegations of fraud and growing protests against Putin and his clique. North Korea, the nuclear enabler of Iran and Pakistan, now faces an indeterminate future under a man in his 20s, Kim Jong Eun. But for those interested in the fate of the Muslim world, Kazakhstan is a key arena for change. Unfortunately, in both Russia and China opposition to the new, corrupt elites may work to the advantage of Communists who, while preaching income equality, cannot be trusted to provide an authentic democratic alternative in office. Surely it is tragic to learn that Russian marchers against Putin carry banners with the image of Josef Stalin, one of the most devastating absolutists of modern times. It is equally dismaying that opposition to the aforementioned Guangdong Chinese Communist head Wang Yang, led by his successor as party boss in Chongqing, Bo Xilai, has revived the slogans, songs, and other aspects of Mao Zedong's disastrous ascendancy. To move from post-Communist corruption back to Communist dictation is no solution for Russians or Chinese. Similar "nostalgia for Communism" is, nevertheless, visible in ex-Yugoslavia and other former Communist states. Kazakhstan, a country I have visited and admire, notwithstanding jokes made at its expense by Westerners, offers something different. Its main city, Almaty, is attractive and prosperous. The country includes notable shrines to Sufis such as Hojja Ahmet Yesevi (11th c. CE), progenitor of Islam among the Turks, whose unfinished tomb at Turkestan City was begun by the Central Asian conqueror Timur, known as Tamerlane (1336-1405). Timur was the great-great-grandfather of Babur (1483-1530), creator of the Mughal empire in India. The ninth largest country in land area in the world, with a population of only 15.5 million, Kazakhstan is diverse ethnically, since its borders were drawn by Soviet officials without reference to the identity of residents, and it was utilized by Stalin, the object of wistful longing by Russians, as a dumping ground for dissidents and disfavored ethnic groups. It therefore includes Uzbeks, Ukrainians, Germans, Poles, Black Sea (Pontic) Greeks, Bulgarians, Crimean Tatars, Uyghurs, Caucasian Turks, Chechens and Ingush, and Koreans. While it is about half-Muslim, radical Islam has had little appeal to the Kazakhs. Since the demise of the Soviet Union, even under the ex-Communist overlord Nursultan Nazarbayev and his family, Kazakhs have become the masters in their homeland. Russians interfere very little there. In the fateful 1980s, Kazakhstan was the first Soviet republic to experience widespread public discontent with Moscow's directives. The country suffered significantly under Soviet imperialism, because in addition to its function as a deportation area, it was the center of Soviet nuclear testing – and its space center at Baikonur is still used by Russia. Kazakhstan had a large store of nuclear weapons, inherited from Moscow, which it gave up, returning the armaments to Russia, by 1995. But the Central Asian giant is best known for its oil and gas resources, which rank it as 11th in the world in proven reserves. Energy extraction creates groups of technicians and workers whose submission to state authority may be unreliable if they are not paid on time. In mid-December riots broke out in Zhanaozen, a Kazakh city near the Caspian Sea, where oil workers had been on strike for some months and had occupied the city square. On December 16, which marked the 20th celebration of Kazakhstan Independence Day, government police fired on the strikers, and at least 15 people died. The workers were employed by KazMunaiGas, the national energy company. Kazakhstan is now in crisis. In Asian history, Kazakhstan has a distinctive place as a crossroads. Unlike Russia or China, it is unlikely that a worker-based democratization movement would turn to the former Communist functionaries of the country for guidance; it might, instead, produce a Central Asian equivalent of Polish Solidarity. In contrast with Egypt, to emphasize, Kazakhstan has no significant Islamist movement to fill a political void if Nazarbayev is forced out of power. Soviet "Enlightenment," as cynical and distorted as its uses and idioms may have been, has affected the former Soviet Muslim republics. Kazakhstan is Islamic but not Islamist, partakes of the European standard of education and "modernity" imposed by Soviet Russia, and is rich. Although it lacks borders with Pakistan or India, the potential influence of Kazakhstan in and by South Asia is immense. In June 2011, the Saudi-based Organization for Islamic Cooperation (OIC) adopted its change of name from the former Organization for the Islamic Conference at its 38th foreign ministers' summit, held in Kazakhstan. If the countries of the "Arab Spring" succumb to Islamist control, or, as in Syria, remain under the boots of heartless butchers – and if Russia and China are able to divert their dissidents away from liberal democracy toward a revival of Communism – Kazakhstan may present a uniquely open road to the future. The people of India should remember whence the Mughals came, and take note.